Interstate 49 is the only north-south interstate to span most of the state. This highway runs from the Shreveport metro to Lafayette. As of 2007, Interstate 49 only runs through the State of Louisiana. On the south end of I-49 it is planned to be extened to New Orleans. This extention would run along the U.S. Rt. 90 highway from Lafayette to New Orleans. The highway would end at the current Interstate 10/BUSN U.S. Rt. 90 interchangein Downtown Louisiana. The other extension of the highway is from the Shreveport metro to the Arkansas/Louisiana State Line. This runs along the U.S. Rt. 71 corridor. Two phases of the project are taking place. One is from Mira-Mertis Road to Louisiana State Route 168. The other is from LA St Rt 168 to the Arkansas/Louisiana State Line. This project is expected to be finished by Spring of 2007. In Summer of 2007 the next project will connect Louisiana State Route 2 to Mira-Mertis Road. 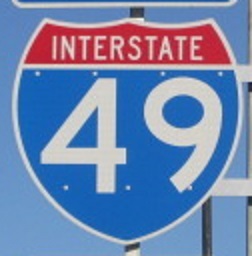 * The northern extension of I-49 would connect to Arkansas State Route 549. Photos of AR St Rt 549 being built can be found here (U.S. Rt. 71; Miller County, Arkansas). While in Louisiana, I-49 is multi-plexed. ...U.S. Rt. 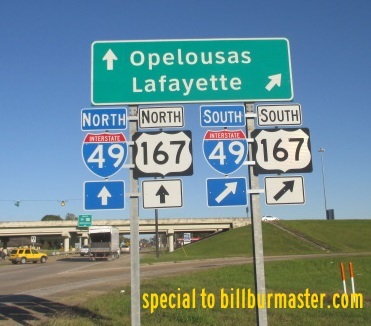 167, from near Opelousas to Lafayette. Interstate 49 crosses the following interstates in Louisiana. There are no branches of I-49 in Louisiana. A guide marker in Lafayette.